Issue #4 of Ares appeared in September 1980. What immediately strikes me about it is its cover by Joe Jusko. Jusko, for those unfamiliar with his name, is a comics artist whose work graced the pages of Heavy Metal and, even more famously, Marvel's Savage Sword of Conan in the '70s. Jusko's presence here is very much in line with what we've seen previously in Ares, whose first issue featured a cover by Howard Chaykin (Jusko's mentor). SPI seemed interested in tapping into existing fantasy and science fiction esthetics rather than cultivating their own distinctive ones. This is in contrast with what TSR seemed to be doing at the same time. Longtime readers of this blog undoubtedly know the approach I prefer. We designed Ares as a cross between a literary magazine and a gaming magazine -- an attempt to create something unique, aimed at helping the two story-telling forms (writing and gaming) to lend their strengths to each other. Because of the base from which SPI operates, however, our natural audience for Ares is more game-oriented than fiction oriented. This doesn't mean the typical Ares reader doesn't want to see good fiction in his magazine; it's just that he wants the game related material to dominate. I find this paragraph fascinating, as I think it confirms my sense that, as the hobby grew outside its initial audience, it became a lot less focused on the fantasy and science fiction literature that initially inspired it. In this issue, there's only a single piece of fiction (see below), "Hillsong" by Jayge Carr, and it's considerably shorter than those in the first three issues. The shift toward more gaming-oriented material is also in evidence in John Boardman's "Science for Science Fiction" installment. This time, rather than talk about how some hallowed element of sci-fi was impossible according to "real science," he instead offers up about a dozen brief science articles about topics that could inspire sci-fi scenarios. This is definitely a better approach, but it still falls somewhat flat in the inspiration department. More interesting is Susan Schwartz's "Facts for Fantasy," which does the same thing as Boardman's piece but with more verve. She draws on myth, legend, and history to present new locales, monsters, and artifacts that can inspire fantasy gaming. It's still a little dry but it's a step in the right direction. "Eye of the Goblin" by David Ritchie is a short piece of "fiction" that's supposed to illustrate a DragonQuest combat. I say "fiction," because it's more of an extended vignette than a true short story and it's not an especially good one, being a typical example of the "gaming fiction" that would come to prominence later in the decade. "Arena of Death" by Simonsen and Ritchie is a standalone gladiatorial combat game derived from DragonQuest. It can easily be integrated into DQ adventures and campaigns or treated as a wargame in its own right. Reading it I was reminded of just why I could never get a DragonQuest campaign off the ground in my youth: its combat rules are just too complex for my feeble mind. Accompanying "Arena of Death" is an article by John Greer on "The Weapons of Arena of Death," which presents stats and historical information about various medieval and ancient weapons. The issue includes book, movie, and television reviews, many of which are quite lengthy. The one that immediately caught my eye was the review of the PBS series, Cosmos, which I adored a younger man. It's stuff like this that really helps to put Ares into a wider context for me in a way that Dragon rarely did. Ares seems much more engaged in the wider world beyond the hobby, while Dragon was very cramped in its approach, concentrating largely on the hobby and, even more specifically, on TSR's own offerings. Snarky reviews of fantasy RPGs also continue in issue #4, starting with Chivalry & Sorcery, which is, surprisingly, treated with respect for its "original concepts." Nevertheless, the reviewer recommends using it primarily as a resource for other games rather than as one to be played in itself. Dave Arneson's Adventures in Fantasy make out even worse: "The price is high, the graphics are terrible, the rules are worse." Yet, the reviewer still finds the game "fun" in actual play. Closing out the issue is an article describing "DragonQuest Tournament Combat," which is intended to streamline play when time is of the essence. It's been very interesting reading these issues in order, both because I'd never read many of them before and because I can see the magazine evolving in response to its readers. SPI was always very good at paying attention to what its fans said, so this should be no surprise to anyone who knows the company's history. Ares is also a window on a part of the hobby I didn't know and rarely interacted with during my formative years. Reading the magazine has thus been an education for me. Reminds me of the many letters Kask seemed to be getting in the early Dragons I'm reviewing, wherein he must defend the presence of ANY fiction in the magazine. I loved Dragonquest! Played many a 2nd and 3rd edition versions of the game. Combats took forever, at least compared to D&D, though those fights had more of a realistic feel to them than D&D combats, at least once you got a feel for the system. I miss, DQ, SPI and Ares, all these years later, though it's only been a decade or so since I last played DQ. Ah, the memories. I'm sure the content is good, but I love that Jusko cover! Yep. This was the first issue with some DragonQuest support. 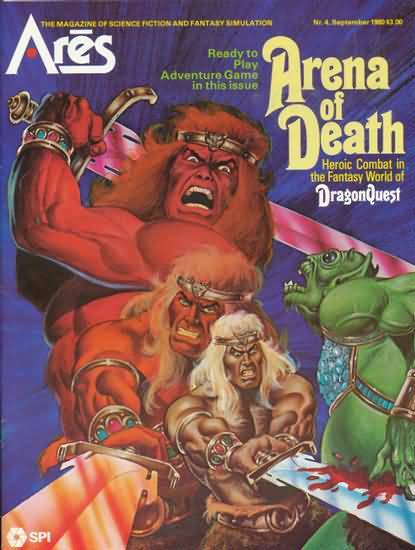 IMHO, when SPI began publishing their own RPGs is when Ares really brought it's A game. Too bad it wasn't enough to save the company. Jusko has been doing a lot of John Carter art lately. I like that cover quite a bit. On a wish-list note, I'd love to see you do the first years of White Dwarf, a magazine I've recently re-discovered my appreciation of.